“Our Lady of Angels”. Anonymous. Gilded and polychromed wood. 18th century. Our Lady of Angels represents Mary, the mother of Jesus. 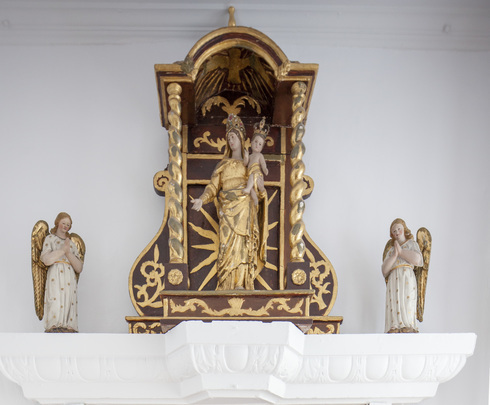 The Blessed Virgin Mary, along with Saint Joseph, protects our Monastery. The devotion to Our Lady of Angels was probably introduced by Marie Lemaire des Anges who arrived in Quebec City in 1671. She had a special affection for the Blessed Virgin. From her alcove, she watches over all who cross the doorstep.